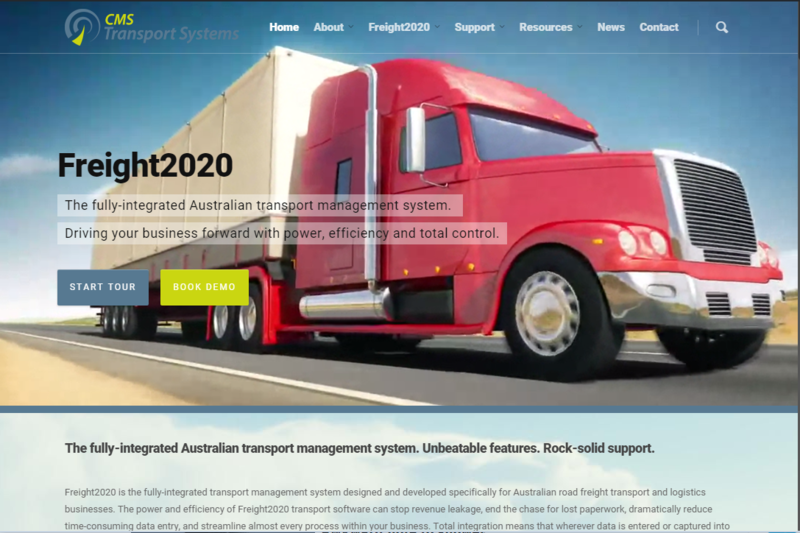 CMS Transport Systems has launched a new website for the Freight2020 transport management system at www.transportsystems.com.au. The new website is designed to illustrate the modular nature of Freight2020 and the power of fully-integrated modules working together. The creative development and technical production of the new website took more than nine months to complete. The new website pages are Google-friendly and responsive across different desktop displays and mobile devices. Freight2020 Operations Management is one of five management modules including Financial Accounting Management, Fleet Maintenance Management, Human Capital Management for compliance, payroll and HR management including subcontractors, and Warehouse Management. Then there are system-wide interactivity options such as the custom-branded Online Customer Portal, Auto-Email Notifications, Driver Mobility, and Item-Level Tracking. Any configurations of Freight2020 can be implemented as a perpetual license or pay-by-the-month cloud-based (SaaS) subscription, and the system can integrate with popular third-party solutions. With our new website, it’s easier to appreciate how data captured into any part of the Freight2020 system is automatically updated and shared throughout the system in real-time. Everyone has the most up-to-date version of information at any moment. The business runs more efficiently with a high level of automation. Customers are kept informed automatically. The business is more profitable and compliant on every level because of the tighter controls and elimination of common errors. The successful development of the new website for Freight2020 is the result of a long-standing collaborative relationship between CMS and the company’s partner in multi-channel marketing, Ginormous, represented by project manager, Melanie Williamson. “We were really pleased to deliver CMS with a new website which is truly reflective of the power and sophistication of their Freight2020 transport management system,” Melanie said of the TransportSystems.com.au B2B website design, copywriting, and production.